We are now one of the few surviving 'Flower and Vegetable' Shows - this will be number SIXTY FOUR. The Edinburgh Allotment Show started in 1953 and was held every year until we ran out of steam and volunteers in 2013. It was resurrected in 2016 in a reduced form. In 2018 we have added more classes to increase interest, especially amoungst our younger gardeners. We continue with this in 2019. The success of the show relies on YOU. We need plotholders to both take part in showing and socialising when we open to the public. Please take part in both. Again, we will control costs and complexity by holding it on a single day. Set up in the morning, judge into early afternoon, open to the public at 2pm and all cleared away by 5pm. Plot to Plate - for homemade jams and cakes made from your own produce. The traditional paper schedule would cost in the region of £500 to print and distribute. That would double the cost of the show, we will therefore rely on this website and email communication to keep you informed and provide all you need to take part. HOWEVER - A few paper copies of all you need to enter the show will be distributed to all site representatives in June for those without Internet access. Paper entry forms will be available at the show too. The show will be held in the Conference Hall in the City of Edinburgh Methodist Church in Nicolson Square on Saturday September 14th. Entries will be accepted from 9am until noon and we open to the public from 2pm until prizes are distributed at 3.30pm. Then, it all gets torn down for another year. The following links will take you to information on how to show, our classes, regulations and an entry form. Find the Show - a Google map to help you find the show. How to Show - some basic and more detailed instructions on how to best show your prize exhibit. It's not complicated and should help you select the best to impress. 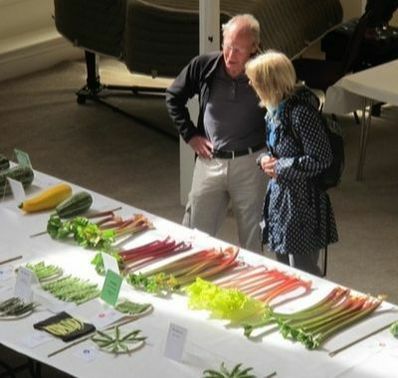 Show Classes - the full list of classes you can enter; flowers, vegetables, fruit, childrens section and giant vegetables. Regulations - very few, but very important. Entry Form - download and print a PDF version. Either bring along to the show - or post it and save time when registering.